Hawthorn berries have been used as a heart tonics for thousands of years, the hawthorn tree was considered to be sacred in medieval times, most likely stemming from a tradition that it furnished the Crown of Thorns. A great deal of scientific study has validated hawthorn's benefits to the cardiovascular system, and the German Commisson E has approved hawthorn for use in cardiac insufficiency. This traditional European herb dilates coronary arteries, improves oxygenation and energy metabolism in the heart, and decreases lactic acid, the waste product of exertion that causes heart muscle pain. Hawthorn improves the heart muscle's metabolism, improving pumping capacity and making the heart's job easier by relaxing the blood vessels. 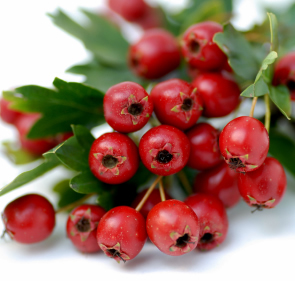 Hawthorn berries are used in combination with motherwort to promote longevity and strengthen the heart. In addition to being one of the most effective and safe heart tonics, hawthorn is also valuable in insomnia and as a digestive aid. 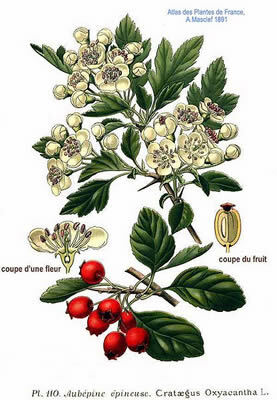 Both flowers and fruit and berries are astringent and useful in decoction to cure sore throats. Preparation Methods & Dosage : Hawthorn works best when taken as a daily tonic over time. 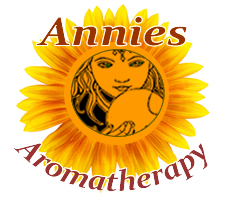 Hawthorn Side Effects: Hawthorn is safe, and can be considered a medicinal food. Flowers: White, rarely pinkish, usually less than 1 in. across, numerous, in terminal corymbs. Calyx 5-lobed; 5 spreading petals inserted in its throat; numerous stamens; styles 3 to 5. Stem: A shrub or small tree, rarely attaining 30 ft. in height (Kratos = strength, in reference to hardness and toughness of the wood); branches spreading, and beset with stout spines (thorns) nearly 2 in. long. Leaves: Alternate, petioled, 2 to 3 in, long, ovate, very sharply cut or lobed, the teeth glandular-tipped. Fruit: Coral red, round or oval; not edible. Preferred Habitat: Thickets, fence-rows, woodland borders. Distribution: Newfoundland and Manitoba southward to the Gulf of Mexico. But in delicious, blossoming May, when the joy of living fairly intoxicates one, and every bird's throat is swelling with happy music, who but a Calvinist would croak dismal prophecies? In Ireland, old crones tell marvelous tales about the hawthorns, and the banshees which have a predilection for them. It is a tree of Mars. The seeds in the berries beaten to powder being drank in wine, are held singularly good against the stone, and are good for the dropsy.